James Jackson Toth (AKA Wooden Wand) gets plenty of praise for his eccentrically evocative lyrics. But on Clipper Ship, his latest album for the mighty Three Lobed Records, it’s the sound that draws you in. Of course, Clipper Ship‘s stories go beyond the sound, with Toth’s cryptic characters and wry observations weaving the album’s songs together into a distinctive whole. 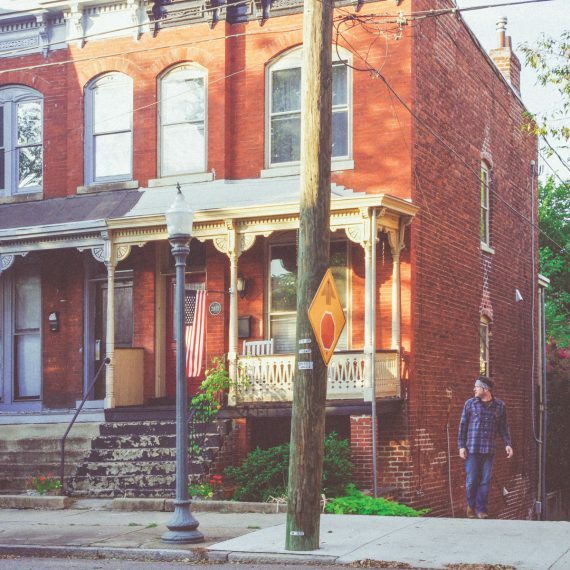 This is the first Wooden Wand album in three years; it’s a more than welcome return. AD caught up with Toth to discuss the record and the nature of psychedelia. Our conversation has been edited and condensed. Aquarium Drunkard: This record feels kind of joyful. We live in crazy times, to say the least, and this record seems to offer a kind of relief from all that. James Jackson Toth: I like the characterization of it as a sort of a rest from the madness. That’s generally how I view music in general. I think there’s always implied social and political bents to a lot of my music, but I like to keep it sort of something that’s not so explicit. I think for instance, the song “Mallow T’Ward The River,” I sort of wrote it as sort of a death ballad, but I think you can apply it to a lot of things that are happening today in politics and elsewhere: it’s about the sort of madness that comes with power. Similarly, I feel some songs talk about sacrifice, accountability, and rolling with the punches to an extent. I think the best songs, especially songs that have lyrics, can work on multiple levels. As far as the vibe of the record, it was recorded over a pretty big span of time, so it’s hard to talk about my mindset. But any time I’m recording, I’m pretty happy. James Jackson Toth: I’m fine with that! AD: I’m drawn to its ambiguous nature and I’m also afraid of it, because I don’t know precisely what it means. I guess it’s one of those words that works like a multi-purpose tool. ‘Vibey’ works in whatever context you need it to. And this feels like a vibey record to me; the sound and interplay feels important in a distinct way, it feels cohesive but also expansive. James Jackson Toth: My one concern was always a sort of consistency. This record and the last one, Farmer’s Corner, were recorded in spurts, at five different locations and five different studios. That’s really out of necessity rather than choice — wrangling people who have very different schedules obviously [required it]. If I had my way, I’d still prefer the total immersion method; holing yourself up in a studio and living inside the record. But I think for a lot of reasons, those days are mostly over. So out of necessity I’ve had to do it in drips and drabs based on people’s schedules and where everyone is in the world. It was one of my main concerns to make sure it flowed the way a record would flow if you just spent two weeks in the same place working on it with the same people. AD: Does recording that way offer any creative benefits for you? In terms of kind of popping in and recording something here and there, do you find that influences the process in interesting ways? James Jackson Toth: It gives you a little more time to reflect, and rather than go in with, [the mindset] “These are the ten songs we’re recording,” you record, say, the most recent three that you wrote and liked. Then a month later, you have two more and want to record those. There were more outtakes on this record than any previous Wooden Wand record. Like in Chicago for instance, with Elkington, Becker, and Kotche and those guys, we recorded four songs. Two of them were a little too rock & roll for this record. They were definitely more in the rock & roll vain. They sounded great and I hope to use them at some point, but they just didn’t seem to fit with the vision I had for this record. I like having those options, whereas before, those songs probably would’ve ended up on the record because we quickly recorded them. I was very mindful of maintaining a chill vibe. AD: “School’s Out” opens with the line, “Let me swim and keep on swimming.” Obviously the first line of any record is always going to be one that carries some weight. Did that line sort of serve for as the thesis statement of this record? It feels very much like a record about doing your own thing. I feel like it that thread carries through on a song like “Mexican Coke,” too. But I agree, first lines of a record have tremendous weight sometimes: “Sailing hardships or broken harbors,” or “Teenage angst has paid off well.” Those are thesis statements for sure. But I’d be lying if I said it wasn’t just a matter of sequencing. I wasn’t sure that would go first until pretty late in the process. But yeah I like that idea. I sort of feel like themes come across in your songs whether you mean them to or not. The author only has so much control over what they’re getting across. At a certain point it’s not yours anymore. AD: So I know I went back and forth on the use of the term vibey a minute ago, but I’m going to use another word I think has taken a beating in recent years: Clipper Ship feels like a psychedelic record too. I feel like this record feels as much like a psychedelic record as it does a singer/songwriter record. James Jackson Toth: I kind of wanted to combine a lot of things that I’m interested in. I liked the idea of a post-modern folk record, where you’re taking elements from old-timey music or pre-war blues and even bluegrass, and applying them to a post-psychedelia, post-’60s framework. Sort of like what Pentangle; they served as a template to some degree. For me nowadays, when I think of psychedelia, I think so much less about private press biker records from the ’60s and Jefferson Airplane. I think more about Hindustani records or the jazz records that Freddie Hubbard made with CTI. Personally I find those records far more psychedelic than, I don’t know, take your pick. AD: Just whatever fuzz guitar laden record. James Jackson Toth: Right, right, ’60s garage psych. But as an ethos, I like the idea of people getting blazed and listening to a record, and getting inside of it and letting it do that 3-D thing that it does. But I’m not necessarily using psychedelic signifiers like fuzz guitar or echoed vocals and stuff. I feel like it’s gotta be a little more nuanced than that. AD: You wrote much of the music in this case before the words, which is a bit of a break in your process normally, right? James Jackson Toth: Yeah, a huge break actually. I don’t listen to a lot of singer/songwriter music, I guess. I’ve internalized so much of it. I definitely wouldn’t front like it’s not a huge influence, like Dylan and Leonard Cohen aren’t huge influences. I feel like I’ve internalized their entire discographies. It feels like those certain types of songwriting are a lot art, like tap dancing or epic poetry. The kind of songwriters I measure myself against are contemporary. Donovan Quinn and Simon Joyner, I mean I envy those guys as writers, and to compete with them seems foolish. Pingback: Shorties (The Arthur C Clarke Award Shortlist, The Political Power of Music Criticism, and more) – Devorado â€” Discover the top stories around the world recommended for you.